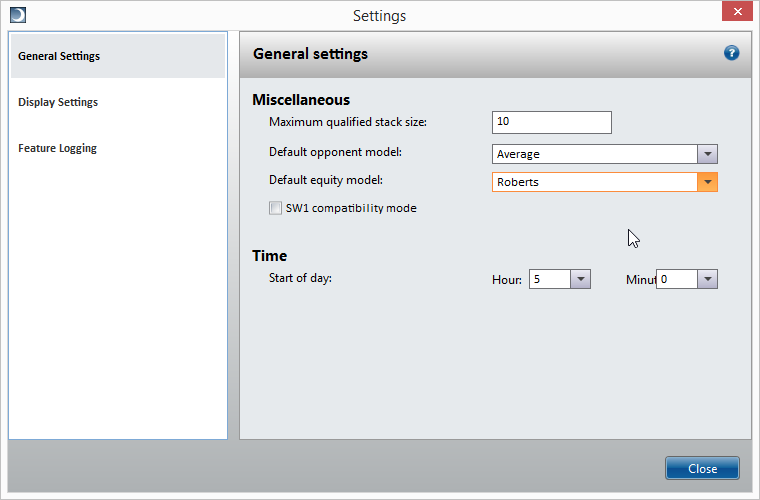 SitNGo Wizard 3 now includes a new type of opponent modeling called the Empirical Opponent Model (EOM). The EOM estimates opponent hand ranges based on actual opponent actions in more that 120,000 real tournaments gathered through anonymous hands collection and other sources. Opponent actions are group by the number of players in the hand, the opponent position, the opponent’s effective stack, and previous actions. 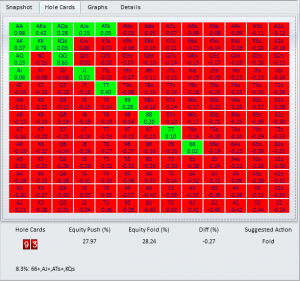 The grouped actions are converted into statistical estimates for each possible opponent action. If an statistics on a particular opponent action are not available due to a low sample count, the Wizard will use the old Average opponent model to estimate the hand range. The Wizard will automatically use the EOM by default so you do not need to do anything to get the benefit of more accurate opponent hand ranges. Keep in mind that this feature is still in beta testing so please report any opponent hand ranges you think may be suspect using the Report Problem button in the toolbar. 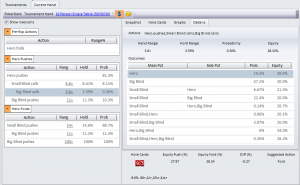 This entry was posted in Uncategorized on April 12, 2019 by SitNGo Wizard. SitNGo Wizard 3 (SW3) has added an option to collect anonymous hand data to help improve future opponent modelling. No data is collected unless you specifically opt in. No personal or identifying data is ever collected. Here’s how it works. If you opt in, SW3 will collect some data from the tournaments that you have imported and send that data to the SW3 server over the web. Your data will be combined with other users’ data and used to create more accurate opponent models in future releases. The models will become more accurate as more data is collected. The Wizard may ask you if you would like to participate in anonymous hand collection. You can also enable or disable collection in the General tab of the Options. 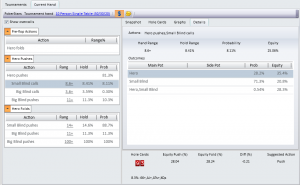 The hash values of the poker site, tournament number, and hero name are used to prevent duplicate hands. 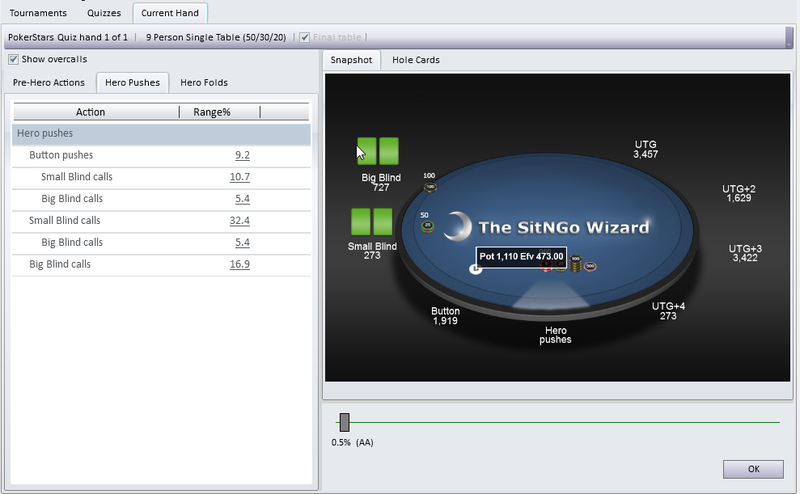 For example, two users who played at the same table in the same tournament could both upload the same hands. The hash values will prevent the same hand from being counted more than once. The hash values make it impossible to determine what poker site or tournament the hands came from. 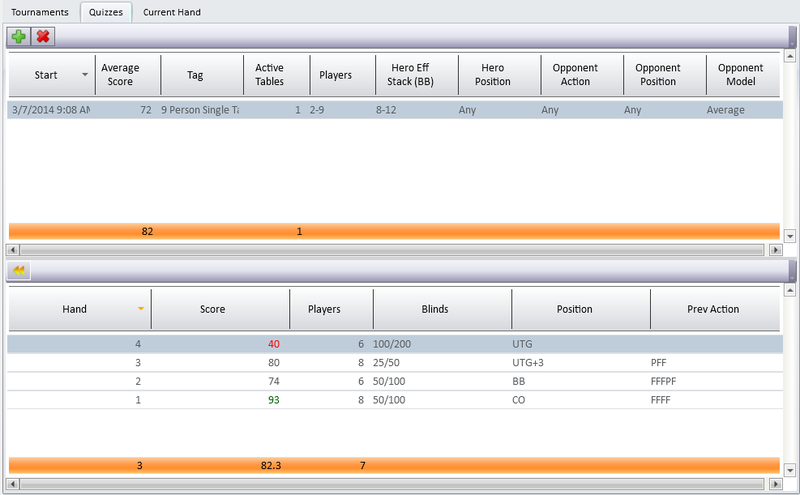 The payouts are collected so that opponent models can be customized for specific payouts. No hand numbers or player names are collected. Why would you want to participate? The more hands that are collected, the more accurate the opponent models will be. If you have any questions, please contact support@sngwiz.com. This entry was posted in Uncategorized on July 30, 2018 by SitNGo Wizard. 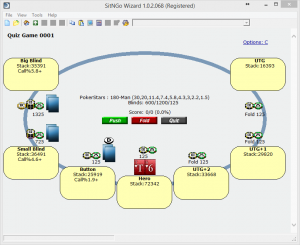 We are pleased to announce the public beta of SitNGo Wizard 3 (SW3), the next major release of the Wizard. If you are already have a SitNGo Wizard license, you can use your activation code to activate SW3. If you do not have an activation code, you can start your free 30 day trial. Keep in mind this is a beta release. Please report any problems you encounter using the built in error reporting or feedback features. This entry was posted in SW3, Uncategorized on April 26, 2018 by SitNGo Wizard. 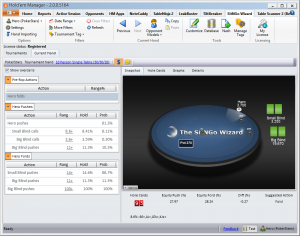 The SitNGo Wizard affiliate program provides website or blog owners with the prospect of referring potential customers to www.sngwiz.com and earning money from every product sale. We pay our affiliates 20% on each sale and all payouts are done via PayPal. Your referral for each visitor lasts for 60 days and applies to both the SitNGo Wizard and Crushing Online SitNGos! Registration is quick and easy. You can begin promoting the SitNGo Wizard right away. Note: This is a new program, so if you were previously a SitNGo Wizard affiliate you will need to register again. Step 4: When visitors are referred to www.sngwiz.com and they make a purchase, you (the referrer) earn 20% commission of the total sale value. You can track all referrals and sales from your referrals via the Stats menu of your affiliate dashboard. Step 5: The commission is paid on a monthly basis. The commission will be paid given that you have earned $50 or more in commission. If not, the commission will roll onto the next month and will be paid once you have reached $50. 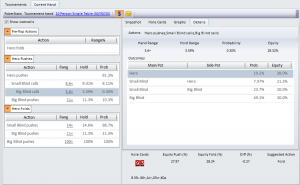 This entry was posted in Affiliate, Uncategorized on July 8, 2014 by SitNGo Wizard. SitNGo Wizard 2 now includes a new equity model developed by Ben Roberts. The new model is an alternative to standard ICM calculations. The Roberts model is faster than ICM and, according to Roberts, more realistic. 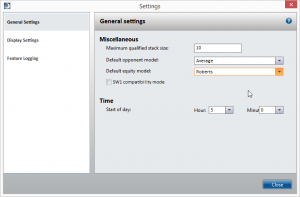 To use the Roberts equity model, open the Settings dialog and change the default equity model to “Roberts”. The settings dialog (click to enlarge). This entry was posted in Uncategorized on April 10, 2014 by SitNGo Wizard. SitNGo Wizard 2 (SW2) now includes a new and improved quiz mode (download here). Before we show you the improvements, it may be helpful to review the SitNGo Wizard 1 (SW1) quiz mode. The SW1 quiz mode generated a series of hands based on your quiz settings. Each hand presented a scenario where you choose whether to push, call a push, or fold. Your decision is based on your hole cards, position, previous action, opponent stack sizes, and opponent hand ranges. An SW1 quiz hand (Click to enlarge). The biggest limitation in SW1 is that it does not allow you to adjust opponent hand ranges. You must base your decision on the default opponent hand ranges, which may or may not agree with your judgement. SW2 addresses this limitation and adds some new enhancements. SW2 includes major new improvements over the SW1 quiz mode. You can adjust any and all opponent hand ranges before choosing an answer. This allows you to make sure opponent hand ranges agree with your judgement. SW2 asks you to select a range of hands which you would push (or call a push) instead of presenting you with a single hand. The quiz settings are simpler. Your quizzes are saved and can be restarted in future sessions. 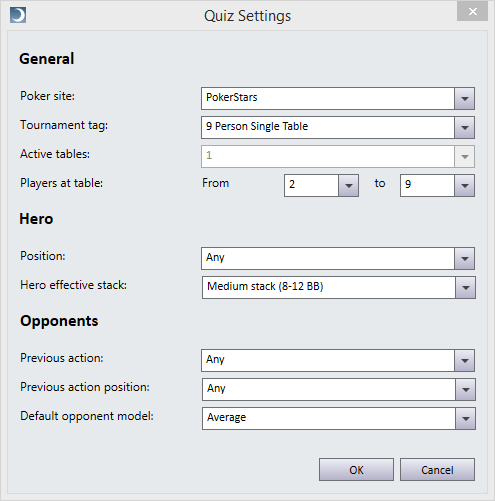 The quiz mode can be accessed in SW2 with the new Quizzes tab located between the Tournaments and Current Hand tabs. The first time you open the Quizzes tab it is empty. The initial quizzes view before you have created any quizzes (Click to enlarge). Click on the green plus sign button to create your first quiz. The quiz settings window will appear. 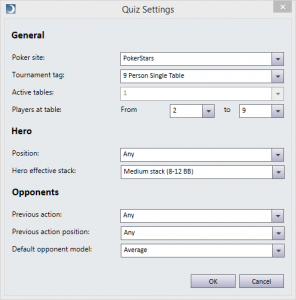 The quiz settings are organized into 3 categories: General, Hero, and Opponents. Poker site – The poker site is needed to select a tournament tag. 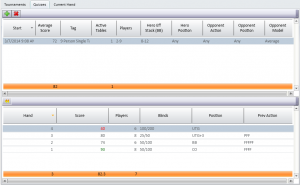 Tournament tag – The tournament tag determines the payouts and blind structure. Active tables – For multi-table tournaments, this sets the number of tables that are still active in the tournament. 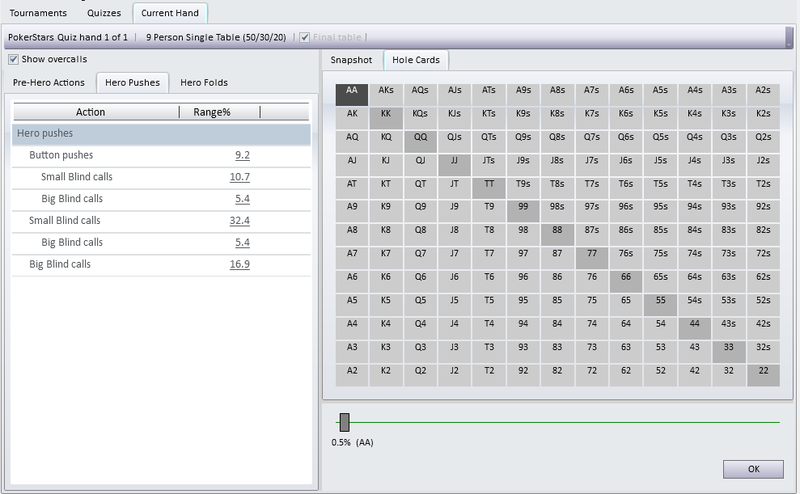 Select 1 table to create final table hands using ICM mode. 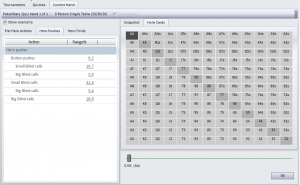 Select more than 1 table to use chip equity mode. 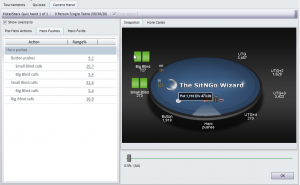 Players at table – Sets the minimum and maximum number of players at your table. Hero settings allow you to target specific scenarios. Position – Sets the hero’s position at the table. Effective stack – Sets a range for the hero’s effective stack. Opponent settings give you more control over opponent actions. Previous action – Sets allowable actions for opponents who act before the hero. Previous action position – Limits which positions the opponent previous action can occur. Default opponent model – Sets the default opponent model used for all opponents. When you click OK in the quiz settings window, your quiz begins and the first hand is displayed on the Current Hand tab. The quiz hand view (Click to enlarge). 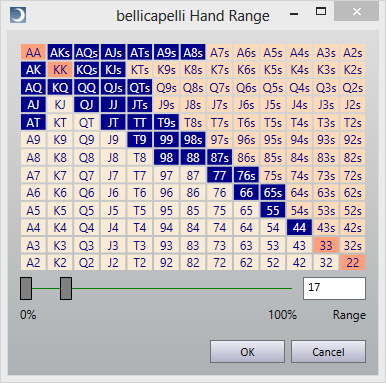 The quiz hand view is the same as the current hand view used to analyze tournament hands except for a few differences. You cannot change the tournament tag or final table option. Only the snap shot and hole cards tabs are available on the right side. The chart and details tabs are hidden. The analysis summary in the lower right is replaced by a slider and an OK button. You are allowed to view and change any opponent hand range on the left. The slider in the lower right pane allows you to choose a push or call hand range for the hero. Drag the slider to adjust the hand range. As you drag the slider, a description of the hand range appears below the slider Click on the Hole Cards tab at the top to display the hero hole cards grid. The hero hole cards grid (Click to enlarge). The hero hole cards grid displays the selected hero hand range. When you move the hand range slider, the hole cards grid displays the selected hands. When you have selected the hand range you like, click the OK button. The current hand view switches into review mode. The quiz hand review mode compares your estimated hero hand range with the correct hero hand range. The quiz hand review mode (Click to enlarge). Your score for the hand. Your score is taking the difference between the estimated hand range and the correct hand range and subtracting from 100. Your score will vary from 0 to 100, with 100 being a perfect score. When you are finished reviewing the hand, click the New Quiz Hand button to create a new quiz hand. A new quiz hand (Click to enlarge). Selecting the Quizzes tab will display all of the quizzes you have created. The quizzes view (Click to enlarge). The top view displays each quiz and the bottom view displays the quiz hands in the selected quiz. 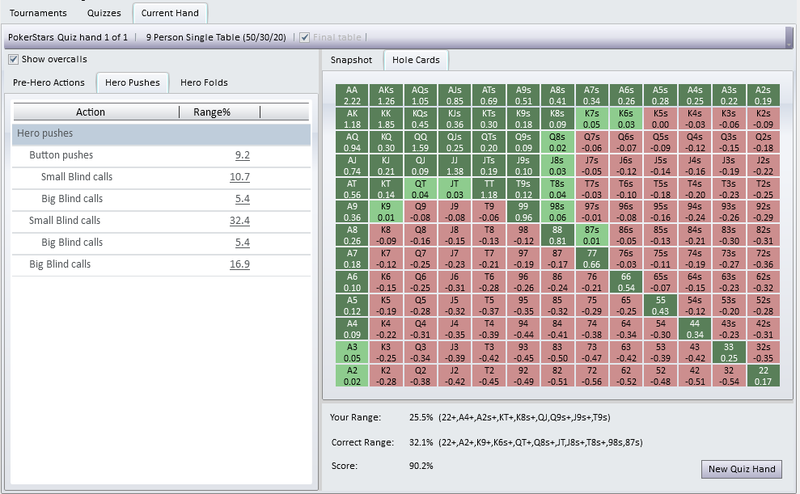 The quiz view displays the average score for all of its quiz hands and the settings for the quiz. The quiz hands view displays the score and the important properties of each quiz hand. The SW2 quiz mode represents a significant advance over the SW1 quiz mode. The ability to change opponent hand ranges creates more realistic quiz hands. Requiring the user to estimate a hand range requires the user to consider the hand more thoroughly, resulting in improved play at the tables. This entry was posted in Uncategorized on March 15, 2014 by SitNGo Wizard. 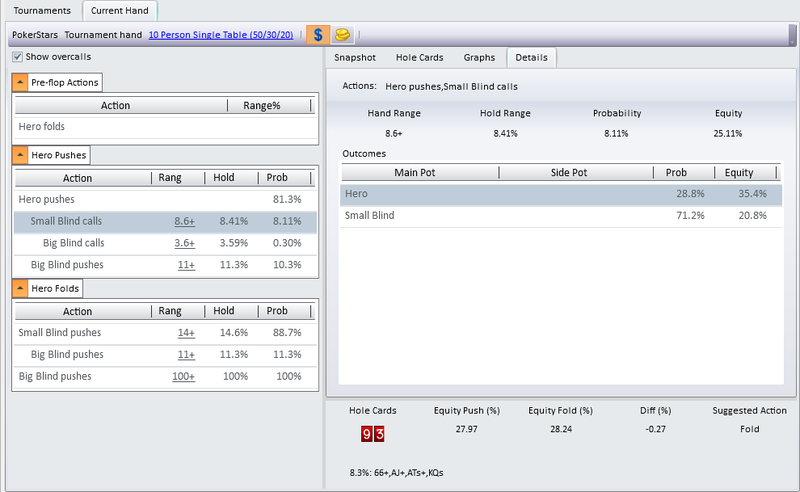 We are excited to announce that you can now apply fully customized hand ranges to any opponent action in SW2. Here’s how it works. When you click on any opponent hand range in the opponent actions view of the current hand tab, the opponent hand range editor will pop up. The opponent hand range editor. There are three ways you can change the opponent’s hand range. Drag the sliders (the gray rectangles at the bottom of the hand grid). The left slider adjusts the hands that are excluded from the range and the right slider adjusts the hands that are included in the range. Type an percentage (from 1 to 100) in the Range text box to the right of the sliders. Click on hands in the hand grid. Clicking on a hand will toggle its state to either include or exclude it from the range. The first two methods use Sklansky/Chubukov hand rankings to determine which hands to include in the hand range. The third method allows you to include or exclude any hand you want in the range of hands. 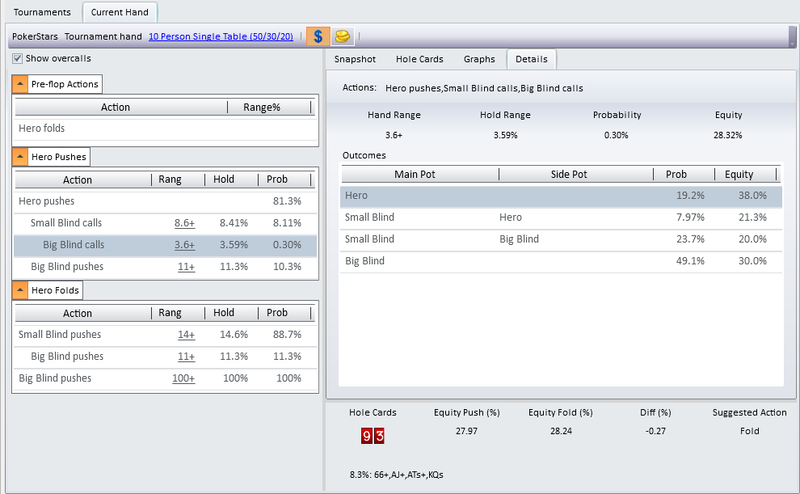 There is one downside to using custom hand ranges: the analysis takes slightly longer to calculate. So use custom hand ranges only when you need them. This entry was posted in Uncategorized on October 10, 2013 by SitNGo Wizard. 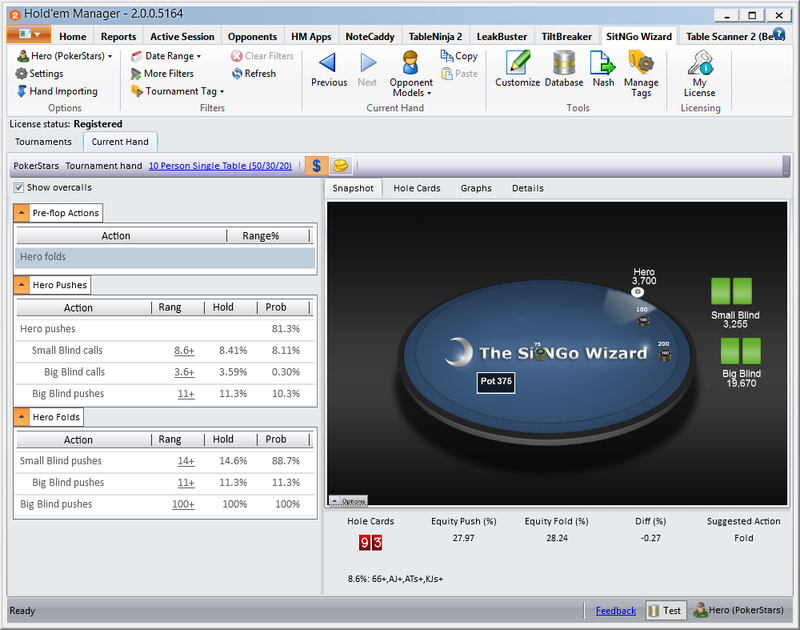 SitNGo Wizard 2 (SW2) computes equity more accurately than SitNGo Wizard 1 (SW1). Here’s why. In order to compute equity as fast as possible, SW1 approximated the case where both players tie by adding half the ties to Player 1’s wins and half the ties to Player 2’s wins. Ties usually occur a small percentage of the time, so this approximation usually has little effect on the final push/fold decision. But it can have a significant effect when the hero has a top hand and opponents have small hand ranges. This combination makes ties occur more often. 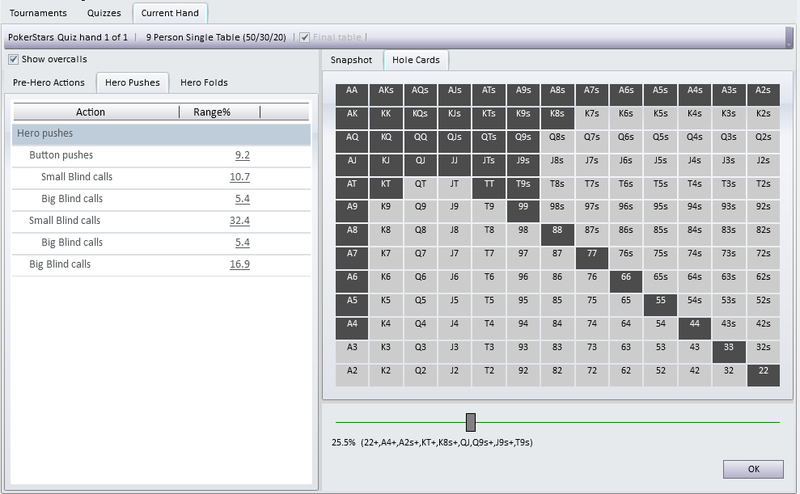 SW2 computes equity when players tie separately and correctly, providing the most accurate analysis possible. An example will help illustrate. Our example hand has 3 players with the hero on the button. 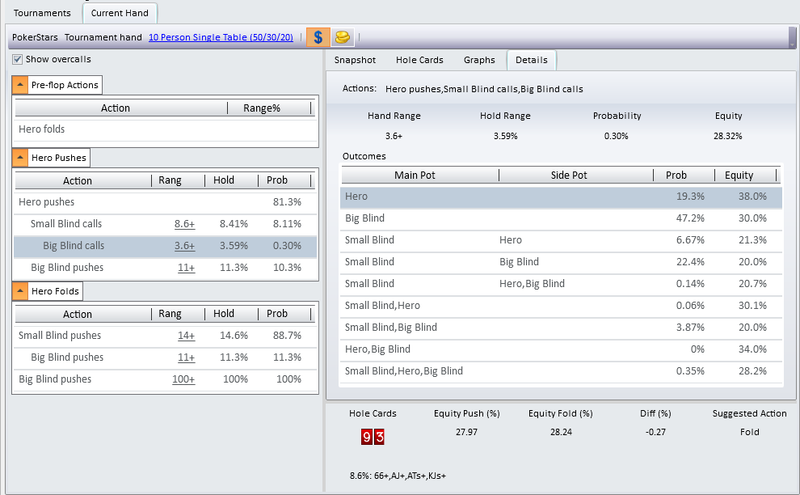 If we open the Details tab on the right and select the Hero pushes->Small Bllind calls action on the left, we see three possible outcomes in the Details view: Hero wins, Small blind wins, and Hero and Small Blind tie. Hero pushes, Small Blind calls (Click to enlarge). The third outcome (Hero and Small Blind tie) is new in SW2. In SW1, one-half of the tie outcome is added to the Hero wins outcome and one-half is added to the Small Blind wins outcome. To see how SW1 calculates the outcomes we can set the SW2 to compute equity just like SW1 does. 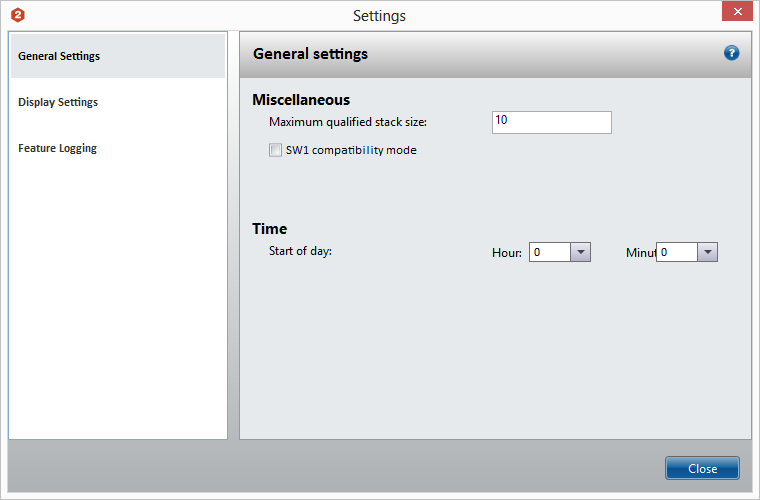 To do this, open the Settings dialog and in the General settings tab check the “SW1 compatibility mode” check box. Settings dialog (click to enlarge). 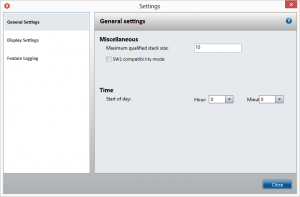 When checked, this option causes SW2 to calculate equity the same as SW1. 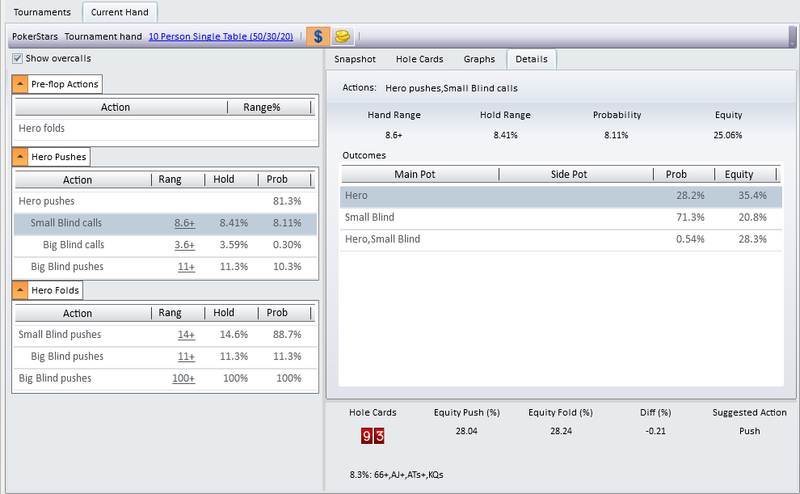 Now the “Hero pushes->Small Blind calls” detail view shows only two outcomes: Hero wins, and Small Blind wins. Hero pushes, Small Blind calls in SW1 compatiblity mode (click to enlarge). By calculating tie outcomes separately, SW2 computes equity more accurately than SW1. Three way all-in situations produce even more possible outcomes. Here is a comparison of the Hero pushes->Small Blind calls->Big Blind calls action. Hero pushes, Small Blind and Big Blind calls in SW2 (click to enlarge). Hero pushes, Small Blind and Big Blind calls in SW1 compatibility mode (click to enlarge). SW2 has 9 possible outcomes, while SW1 has only 4 possible outcomes. So how much does the more accurate equity calculation affect which hands we can push with? For most situations, it has only a small effect. Here is the difference for our example hand. SW2 hole cards grid (click to enlarge). Hole card grid in SW1 compatibility mode (click to enlarge). In this example, the more accurate analysis changes only one hand: KJs becomes a push instead of a fold. This is typical for most situations. But for some hands where ties are more likely the new equity calculation can make a significant difference in the analysis. This entry was posted in Uncategorized on August 19, 2013 by SitNGo Wizard.